I spent too much time trying to decide if the first one was grammatically correct before I noticed the second one. The first e's and the second e's were not written by the same bad grammarian. What we have here is a copycat language murderer. Bring in vice. No way... check out the "a" in both plates. SAME!!! 's means that the plate is. That is what is wrong with this picture. 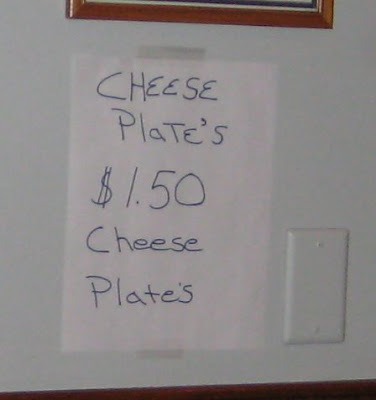 The correct word is 'plates'. Just come and live in a small Texas town and you'll see the best grammar and spelling that you've ever imagined - they have lots of 'Hugh Garage sales' down here and Wendy's was hiring 'mangers' at one point (that one was up on their marquee for about a month, excellent!). I would allow them to get away with the first one. They are serving a cheese plate and the Cheese Plate's a buck fifty. I'd walk up to the counter and say, "How much for a cheese plate?" The chick would say, "Cheese plate's a buck fify." Instead of asking, I just look at the sign. This place probably only made one anyways knowing no one would eat it. My in-laws insist that "you" cannot be a plural word, so every card they send us is modified to "you's". "Plate is" would be incorrect. "Belong to plate" is incorrect.